From an early age we have learned to visualize a world of recognizable shapes and colors, from white puffy clouds to a soft furry teddy bear clutched in our arms. Each of us has a unique way of viewing our experiences that somehow fit in a distinctive way that binds us all together. The Monster Show, a three-person art exhibit currently at RNG Gallery, reinforces that premise as it engages all of our senses in an uncommon but familiar manner. The very word the show takes its name from explains it so well. Monster is a formidable force of three very talented young artists, Will Anderson, Leslie Diuguid and Dan Crane, making their mark in the art world. Anderson is considered the anchor of this quite distinctive group. His art is somewhat mysterious and simplistic, and when you take a closer look, it is also very complicated. Dinosaurs may be his subject, but color is the star. His thick oil paint techniques add to the vibrancy of his work. Diuguid takes a different approach to her pieces. She works primarily with fabrics. “A change of space helps to push me and has been a big influence on my work. Since I have been at the Union (Union for Contemporary Arts) I have challenged myself to move on and to grow,” Diuguid said. Her works are mostly large in scale but always impactful. Diuguid’s work i lively, and you just want to touch her pieces. It is so inviting and playful that you cannot help but smile. The bear coming out of the piece “How Do You Stop It, Shortcake” wearing a strawberry t-shirt salivating for his fish implicates a mood of helplessness and humor. However, there is a mysterious side to her pieces too. 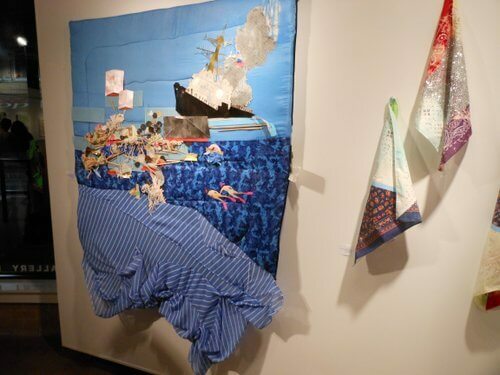 There is a deeply psychological narrative with her work “Sandy…Too Soon” of a shipwrecked cruiser and a sense of escape that narrates from within the art. Her works are so bright and colorful with a childlike quality that is not simplistic in any way; Diuguid’s works are powerful and naïve in a conundrum of emotion. “This show is edgy and it has been a metamorphosis for all of us including myself,” Diuguid said. Crane also embodies that sense of mystery. His approach to artistic expression is a multimedia style that Crane does so well. His sculpture of the couch has hints of his childhood intertwined within the piece. The items hanging from the couch are items that Crane has kept and reused for this sculpture. A retrospect of his life on display it is an autobiography of some of his most cherished childhood possessions. Crane truly puts himself within his art. One of his pieces even has some of his DNA mixed within it. His animated art can be garish in nature. He exposes one’s true self to reveal a stripped down version of identity and nature, a theme he tends to express in his works. These pieces make you think and squirm all at the same time. “Entertaining one’s self is kind of a monstrous thing to do. Jurassic park and surf boards and toys and furry fabrics,” Crane said. He picks the artists, but he does not interfere with their creative process. He allows the artists flexibility and lets them dictate what pieces they will incorporate into the show. The pieces form a pervasive awareness of all the images and objects, from which there is no escaping. The images and objects that we know have been crowded out by fantasy and whimsy and a whisper of times gone by. It is clear that each artist has their own story to tell but together the story becomes entangled with each other in unpredictable ways. The stories are slightly disconnected, but are also bound together, however contrived. This show represents both the creativity of the artists and the individual – a “Monster” of a show that comes together to defy nature itself. The Monster Show continues through December 9th at RNG Gallery 157 West Broadway Council Bluffs, Iowa 51503. For more information call 712-256-4140.